After two winter weather delays, we were finally able to have our holiday party at Quilt Night this week. The weather was still a bit dicey, but we were determined to make it happen. This year, we had a potluck dinner and we each brought a white elephant gift from our sewing room for a gift exchange. 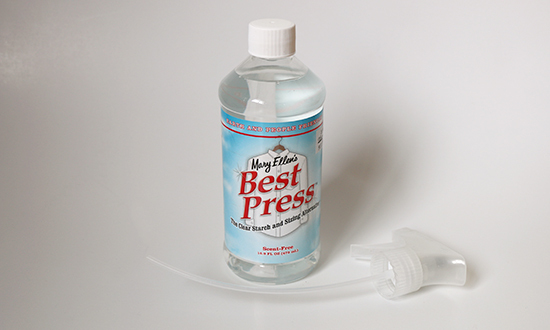 I was surprised to receive a 16.9 ounce bottle of unscented Mary Ellen’s Best Press. If you’re unfamiliar with it, Best Press is a spray starch that does wonders for keeping quilting fabric crisp and smooth — and, no, I’m not affiliated with them. I was shocked that someone gave the Best Press away but, as the saying goes, “one person’s trash is another’s treasure.” I gave away a panel of self-adhesive Moda fabric covered in snowman parts and clothes. The idea is to cut out the pieces and stick them onto your project as if you’re dressing paper dolls. My girls have each made their share of “appliquéed” snowmen and they’re getting too old to be interested in making more of them. I also gave away a book of sewing tips and tricks that I had read but wasn’t using as a reference as I expected. Both of those gifts were also met with shock; the woman who received them couldn’t believe I didn’t make a mistake in giving them away. Recycling is such a wonderful thing! We all chipped in on a nice gift for our hostess, and she surprised us all with individual white elephant gifts. 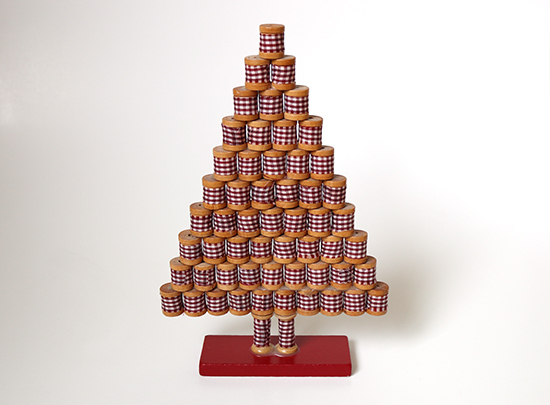 I received a tabletop Christmas tree made from wooden spools. A few months ago, J— was trying to figure out what to do with some cheap vodka she had found in her cabinet. 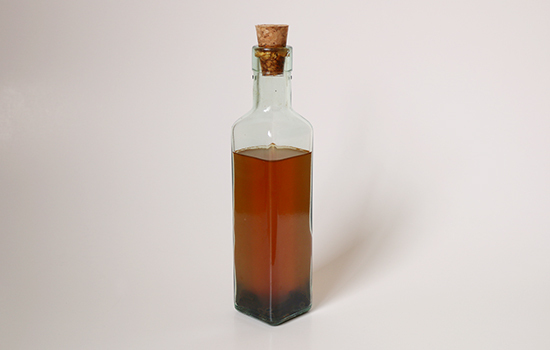 Some of us suggested she make her own vanilla extract, and we had a lively conversation about vanilla extract recipes. Some of us had made our own before, while others had never heard of it. Unbeknownst to us, she did a little research and shopping after that night and we all received a bottle of homemade vanilla extract at the party. To keep with the quilting theme, J— wrapped each bottle of vanilla extract in a fat quarter that she had ice-dyed herself. All in all, it was a wonderful evening with good friends that extended our holiday cheer. Speaking of extending holiday cheer, I recently started reading the We All Sew blog by Bernina. Regardless of the brand of sewing machine you use, they write about pattern ideas, fun projects, and general sewing tips — once again, no affiliation. Leading up to Christmas, they were giving away gifts as part of their Holiday Countdown 2016 celebration. I only remembered to enter a few of the giveaways, but I won one! This week, I received an 18-spool package of Mettler Silk-Finish Cotton 50 thread. Between the Best Press, the fat quarter and the thread, I’m looking forward to revisiting some quilting projects. What has inspired you recently?